The monument commemorates the centenary of the Mittagong Railway from 1867 to 1967. The station opened on the 1st March 1867. By the second half of the 19th Century, in the colony of New South Wales, the Great Southern Railway that ran from Sydney to Picton had become totally inadequate. Settlement was spreading south beyond Goulburn and valuable natural resources such as marble and sandstone, coal and shale, as well as timber and farm produce had to be carted to Sydney by bullock wagons over difficult terrain on roads that were at times barely passable. For people travelling the journey was tedious, slow, uncomfortable and often downright dangerous. In 1863 the Colonial government decided to extend the railway southwards, to include Mittagong, Bowral, Moss Vale and Marulan, and to then terminate at Goulburn. 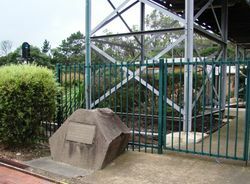 Under the direction of Engineer-in-Chief John Whitton, the work was completed in 1869, giving a total distance from Sydney to Goulburn of approximately 224 kilometres.